Poor D5 gets the heat again! I know they don't care but how about a 7 or 8 am start and rotate divisions through the schedule? Are we sure that is the course map?....seems significantly different from last few years. This is map when we used to run the "real" Stanford course with hills. Thanks for the memories Albert. They would have to cancel the race nowadays if they raced the old course with the heat. The map has been fixed and that should be the current course that they have used over the past several years. Of the top 10 teams from last year, assuming they are all back (? ), all have at least two scorers who graduated, except Jesuit, putting my chips on them to continue their stellar early season run. Of returning individuals, not sure if Rocha from Arcadia is back, but if so, would be his first competitive XC race this season. Would not be surprised to see Vernau of Davis and Kurdy of Jesuit battle it out to the finish. Someone should get Vernau's training plan over the last year, he finished 87th at Stanford last year with a 16:27 finishing time and would not be surprised with a sub 15:20 time (more than 20 seconds/mile faster than last year!). On the girls side,....O'Keeffe only won Stanford by 24 seconds, expect her to keep rolling, though am interested to see Rylee Bowen if she comes back. You will not know the teams approved for the seeded race until Saturday or who is running for those teams? Also, are there schools that run 2 teams - seeded and varsity? Still don't understand why they don't rotate the divisions. Sal 9:03: Bellarmine will be running a team in the DI and Seeded divisions. Jesuit will be running Top 7 in Seeded race, second 7 in D1. I was spoiled for a few years going at 9am and 9:30am with the other division V schools. I think they should rotate the divisions yearly and just keep the seeded and college races where they are now. I believe Davis HS will also have teams in the seeded and divisional races as well. Unless someone has inside information, you can tell the teams that in the seeded race by the number of runners listed. If 14 runners listed (7 in the seeded, 7 in the division). I saw this for McQueen (NV), Arcadia, Jesuit, Bellarmine, St. Francis (CCS) and Punahou (HI). One can assume that although Davis and Trabuco Hills only list 7 male runners, that there success would land them in the seeded race as well. The addition of D1 defending champion Philip Rocha to the seeded boy's race should be interesting as this will be his first competitive cross country race of the season. 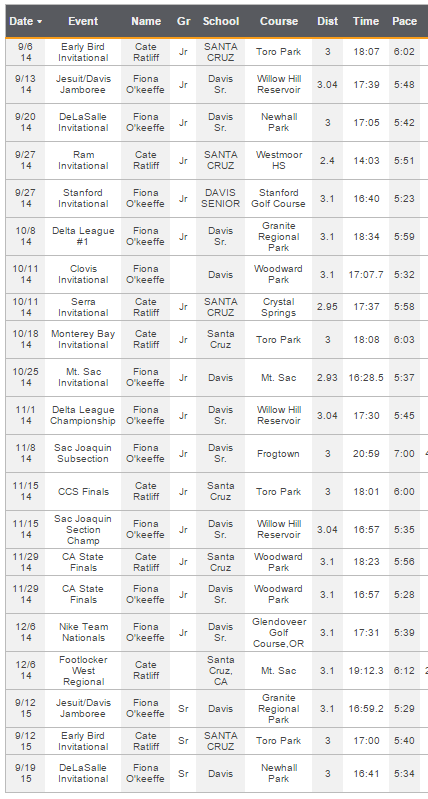 Anyone know if Santa Cruz's Cate Ratliff is running in the Seeded Girls race or the D2 race? If she's in the Seeded race, she and Fiona O'Keeffe will have an interesting matchup. I ran at a D5 school several years back, and my senior year we were the first race of the day. I didn't run a particularly impressive time (I think maybs 16:20s or 30s), but because all the fast races were in 100 degree heat, my time ended up being top 100 or so overall. After that weekend I started getting college recruiting letters, all because of the early start time! Cate is running in the D4 race. Since someone asked, comparing Fiona and Cate's races over the past 2 years. Cate Ratliff will have the fastest time of the day. You heard it here first. From the guy predicted a win sub 17 minute & course record at Toro. For what it's worth....AccuWeather predicts temp. at 1pm at78 with temp. feeling like 81. Last years temps were slightly cooler than those predicted for this saturday. Definite need to rotate yearly. and by 3:30pm it is forecast to be 84 degrees with humidity down to 38%. Weather.com forecast has 88 for a high on Friday and 82 on Saturday. High pressure could linger. But is this a surprise? Last year was the first cooler year in the past decade. It has been 90 degrees more than 70. If you don;t want hot weather probably should run somewhere else. We need a designated XC course in half moon bay. Only way XC actually can run in cool temps. Stop worrying about the heat, big deal, it was hot all summer when you should have been out training. You're not a runner are you? Either that or you've never RACED in hot weather. Heat is a big deal no matter how much you've trained in it. Temperature has an effect of performance similar to altitude - the higher the temp, the greater performance degradation. Duh - we know that. Above around 68 degrees, it works out to a very rough estimate of 1% degradation of performance for every 4 degrees of temperature increase. Convert race time to seconds, then multiply by (1.0 - [temp-68 x 0.01]) = corrected time in seconds -> convert back to minutes and seconds corrected to 68 degrees (again rough estimate). A whole lot of talk about temperatures on here and I haven't heard any of the kids complaining. At the State Championships, the D1 race is always run in the heat of the day (granted, heat not nearly as much of an issue in November than September, but last year it was about a 15-20 degree difference). A case could be made that D1 Great Oak lost out on a chance to go to Nike Nationals because Brea Olinda ran much earlier and had a slightly faster team time. The runners competing against each other run in the same conditions, as a competitor that is all you can ask for. When most of these kids were putting in their base miles over the Summer, they would have killed for weather this "cool." A high of 82 on Saturday wouldn't be ideal, but would be about 15 degrees cooler than what Sacramento area teams have had to train in now that practices have had to move to afternoons. You haven't heard kids complaining? You kidding? Stand at the finish line and check out the medical tent tomorrow for the afternoon races. And that when it is 82 degrees. Imagine 100+ like we have gotten. Kids in places that are hot like the Central Valley and the SS run at 6 am. And no D1 does not ALWAYS run in the heat. It is on a rotating schedule. There are some idiots posts on the Internet and this "shut up and run" mantra is the dumb comment here. The ideal temperature where you body uses minimal energy to cool itself is 52 degrees. Look it up. So yes 60 vs 80 is a big difference. Is Isaias De Leon from De La Salle hurt? There is no question that the heat has an effect on the later races. Last year was the first year that I can remember that was overcast throughout the day and even the last races had ideal weather. I have emailed the Stanford coach and meet director multiple times about rotating the schedule and leave the seeded and college races at the same time each year. No reply and they just keep churning out the same schedule year after year now. Okay. This is an awesome meet and thanks to the race directors and organizers. But could you just post what teams are in what races so traveling teams can make definitive plans. The list or participants is nice and confirms entries but what races folks are in seems to still be up in the air. If I am missing this information on line please correct me. To contribute to the heat discussion, here are the median times considering all races over the past 5 years. They never post who is in the seeded races. Teams sign up to be specifically in those races so not sure why that is so difficult to figure out before the meet. Also keep in mind that the course is not always the same. It's been a while since there was a massive change (when they stopped going through the tunnel to the other side of Junipero Serra Road), but even in recent years there have been slight changes around some greens. Agreed, but I would guess that the course changes since they eliminated the tunnel have a 2nd order effect (as the mathematicians say) and temperature is 1st order. Pretty hot at the Clovis invite and don't see a lot of complaints about the weather, it's XC deal with it. Shut up and run! 1. Stanford is not in Fresno. The Central Valley is known for heat. 3. Yes, there's a lot of complaints about the heat. 4. You're obviously not a runner, let alone one who ran fast. Cross Country is supposed to be run in cool fall weather, not 90-100 degrees. There's a difference between expressing concern about how heat effects performance and complaining. Anonymous (10:04PM) reminds me of a macho friend I used to run with. Every time one of our group was out due to an injury he would say, "Come on..it's just pain!" Inferring a little pain wouldn't stop him. He had been lucky never to have been injured. Then he experienced plantar fasciitis and couldn't run for two months. Just like anonymous (10:04PM) his macho attitude towards every thing was a simple-minded, "...deal with it. Shut up and run!" 5:40AM is right...10:04PM is an idiot. Let's please stop with all the anonymous name calling. It really takes away from the intent of the post which is to have a civil discussion about tomorrow's meet. Sorry, but it's hard not to respond to some gentleman saying, "Shut up and run!" But...you're right...we just shouldn't take the bait. It's cross country, do you wanted perfect conditions an golf courses so you don't get dirty? Have you ever seen a European style XC race through the mud run in freezing conditions? Or world XC in Kenya at altitude run in 90 degree heat. If have a problem with a meet because of the Weather don't go. Don't take the bait....don't take the bait...don't take the bait...don't..
10:04 PM/11:59 AM, you are completely ignoring the facts presented to you. There is absolutely no one who has expressed that they do not wish to run because of the heat. They're saying that weather affects times, which is backed by undeniable scientific evidence. Because of this, they are proposing that the meet rotate the race times of each division each year so each team has an opportunity to run some of the faster times at least every 2 or 3 years. Maybe you would have realized this if you have actually made a reasonable effort to read what they had written. Good luck with that, it's Stanford meet and they do what they want. Just wondering, rather warm at Mt Sac. Do they rotate the times of the races every year? Use the advanced features to see the differential in time between races run at different temperatures. The races this morning were run in very muggy, humid conditions due to the usual overnight watering of the course combined with the early sunshine. The races later on were drier, but warmer. Judging by the results and comparative performances, it seems nearly a wash, but I am sure people will want to hash that out all the same. It was about 68 degrees when the races began at 9am and 76 degrees when the seeded races got underway at 12noon. The temperature rose a bit from there, but nothing stifling. Good day for a meet.